IT'S A blistering summer day in Piazza Santa Croce, an ancient square in Florence, Italy, fringed by a 14th-century church and a towering marble statue of Dante Alighieri. Usually a gathering place for churchgoers and reverential tourists, today the piazza is a setting for battle. Two teams of muscular, tattooed, bare-chested men are engaged in hand-to-hand combat over a ball, though with all the bodies flying, it's often impossible to say where it is. A thousand spectators sit in bleachers set up around the square, yelling with rapacious glee. The melee is intermittently obscured by thick, red smoke, generated for the occasion by a machine, creating the illusion that all present—including old Dante—are peering into the fiery depths of hell. For anyone who has ever watched a soccer match and complained about the players' histrionics—the flops, the well-practiced looks of agony—this is another, more Ramboesque, version of the game. 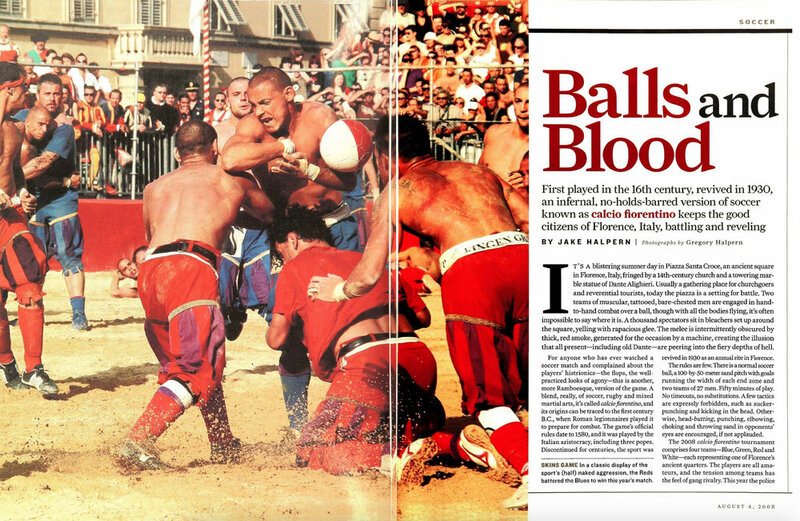 A blend, really, of soccer, rugby and mixed martial arts, it's called calcio fiorentino, and its origins can be traced to the first century B.C., when Roman legionnaires played it to prepare for combat. The game's official rules date to 1580, and it was played by the Italian aristocracy, including three popes. Discontinued for centuries, the sport was revived in 1930 as an annual rite in Florence. The rules are few. There is a normal soccer ball, a 100-by-50-meter sand pitch with goals running the width of each end zone and two teams of 27 men. Fifty minutes of play. No timeouts, no substitutions. A few tactics are expressly forbidden, such as sucker-punching and kicking in the head. Otherwise, head-butting, punching, elbowing, choking and throwing sand in opponents' eyes are encouraged, if not applauded. The 2008 calcio fiorentino tournament comprises four teams—Blue, Green, Red and White—each representing one of Florence's ancient quarters. The players are all amateurs, and the tension among teams has the feel of gang rivalry. This year the police have tried to tame the game with new rules, including one barring convicted criminals and anyone whose play in previous years has been deemed too violent. The Greens lost 20 players because of this rule, including Alessandro Pagliazzi, who was disqualified for kicking an opposing player in the head. "Whenever I see games in which I cannot play, I tend to cry," he said before the tournament. Mirko Cardelli, another disqualified player, is a kickboxer who broke both hands during a calcio fiorentino match but kept playing; his only gripe was that he couldn't urinate properly for weeks afterward. "The officials betrayed all of Florence by changing the rules," he said. "I don't see why they have to treat us like animals." SINCE 1981 the Blue team has won all but five titles. This year, however, so many of its players have been disqualified by the police that the team is composed almost entirely of rookies. Still, it advanced to the finals to face the Reds, whose roster had far fewer disqualifications. On the practice field the day before the final, the Blues gravitate toward a bald, barrel-chested man, whose meaty biceps is emblazoned with ZENA. He is 52-year-old Gabriele (Zena) Ceccherelli, and he has been Blue's star player since he was 16. This year Zena was disqualified by another new rule that bars players over 40. He isn't happy. "For 10 years people have told me I'm too old to play," he growls. "I always answer them on the field!" Zena functions as the team's father figure, part coach, part cheerleader. His concern was that the Reds would rely on their fighters—amateur boxers and wrestlers—to stymie the faster Blues; then Red's speediest ballcarriers, its rugby players, would weave between the skirmishes and toss or kick the ball across the goal to score. (Each goal is worth a point; failed attempts earn the defending team a half point.) In the past, Blue was immune to such tactics because it might have a dozen boxers on its roster; this year it had just five. The Blues' only hope was to keep the ball moving. Before the final all the players—along with 500 Florentines in Renaissance garb—parade through the streets. Once, the procession stopped at the church of Santa Maria Novella so the players could pray (presumably for their lives). In the late 1990s, however, players brawled in the church, damaging a 15th-century fresco. Now Santa Maria Novella is off-limits. Church bells ring; cannons fire; the game begins. A referee throws up the ball, but hardly anyone on the field pays attention. A phalanx of Red players moves forward, fists up, ready to brawl. Boxers from the Blue team meet it, and the punching begins. Next Red's wrestlers rush forward and fling themselves at their opponents. The air is thick with the spray of sweat, and there is blood in the sand. Then, out of nowhere, the ball reappears. A formation of runners from the Reds—the rugby players—sprints into Blue territory. The crowd sees it, but most of the Blues don't. They're too deep in battle. A Red player throws the ball at the goal from 15 yards out; it bounces once and pops in. The crowd roars. Cannons fire. It's 1--0, Red. The Reds run a similar play and score again. The brawling continues. The captain of the Blues, 38-year-old fishmonger Riccardo Caparrini, takes a vicious blow to the head and is knocked out. Blue stages a brief rally, closing the deficit to 5--4 with 20 minutes to go, but Red's boxers and wrestlers batter their way to a 9 1/2--4 victory. Afterward the defeated Blues stumble onto the ancient, cobblestone streets—bleary and bloodied. Zena says that he is already thinking about next year when, he hopes, the rules will be amended so that he can return to the pitch and face the Red players. "Ce li mangiamo!" he vows in a low, hoarse snarl. We will eat them!